The IMF supports the efforts of the Ukrainian authorities in the fight against corruption. President Petro Poroshenko in a telephone conversation with the Managing Director of the International Monetary Fund Christine Lagarde "coordinated approaches as regards the establishment of the anticorruption court in Ukraine, taking into account the relevant initiative of the President, as well as ensuring the effective functioning of anticorruption institutions," the presidential administration said in a release on 8 December. Poroshenko and Lagarde called on the Verkhovna Rada " to demonstrate ultimate responsibility and to get united in support of the draft law on the anticorruption court so that it be considered as soon as possible, already this year." 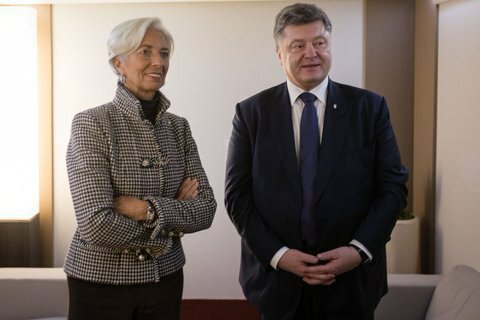 Lagarde assured that t the IMF supports the efforts of the Ukrainian authorities in the fight against corruption, building upon the achievements made in setting up new institutions so far. Poroshenko, in turn, informed Lagarde about progress on the path of reforms in Ukraine. After the conversation with Poroshenko, the IMF issued a statement of Lagarde saying: "We agreed that the immediate creation of the Anti-Corruption Court is an important addition... In this regard, I supported the president's agenda on the submission of the bill in the parliament in the coming days in accordance with the recommendations of the Venice Commission and previous agreements within the framework of the IMF-supported program .It is important that all members of parliament unite for the sake of the bill and endorse it in the priority order ". “I assured the President that the IMF stands ready to continue to support Ukraine, along with other international partners, in the fight against corruption and encouraged the authorities to accelerate the implementation of reforms,” she said. Earlier, the head of the EU Delegation in Ukraine Hug Mingarelli said that there is no need to discuss the creation of anti-corruption courts in Ukraine, it simply needs to be established.